After spending a week re-provisioning (necessary after CBP confiscated all my fresh food) in Port Canaveral I was ready to start Sarah back north. I'm still not sure how far north I will go - I have the vague goal of briefly returning to the Chesapeake Bay and seeing friends in Solomons, MD. However I will likely put Sarah into a winter berth well south of the Bay. I want 2008 to be the last winter I spend with Sarah locked in ice. The night before I planned to depart the Cape Marina Victor and Gigi on Gigi's Island arrived. I had met them in Marsh Harbor back in April. They had departed from Green Turtle Cay the previous day when warned a cold front later this week would shut down the Gulf Stream for cruisers for an extended period. 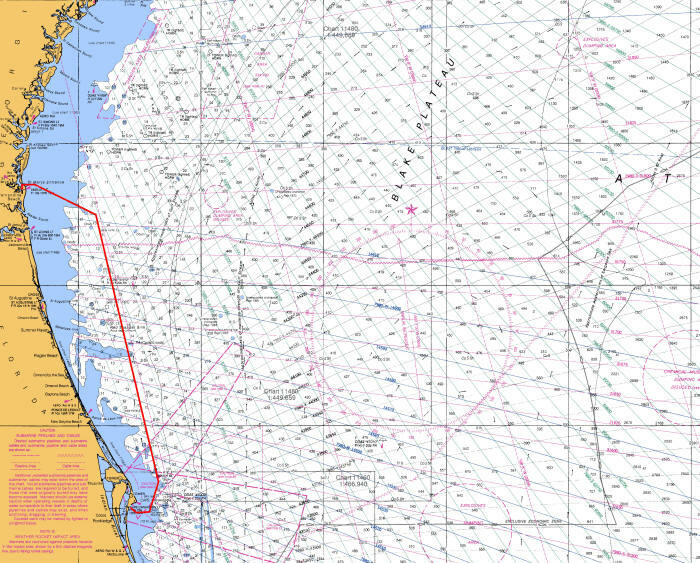 They had planned to sail directly to Fernandina Beach, FL, but they encountered very uncomfortable seas in the Florida Strait and decided to duck into Port Canaveral for the night and resume their trip the next day. This gave us a chance to have dinner together and plan to sail together to Fernandina Beach the next day. 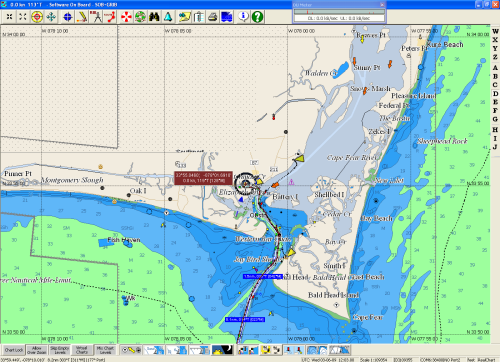 Below is the approximate route I followed from Port Canaveral to the St. Marys River. This trip took me over 24 hours. 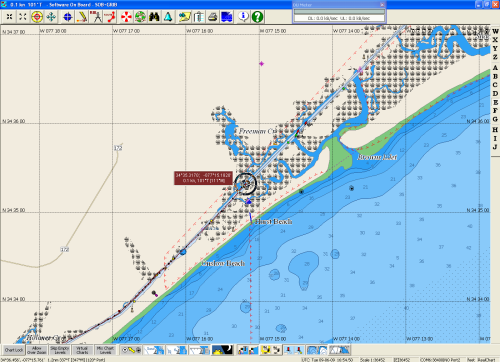 I left the Cape Marina, after fueling up, around 10:00 AM and arrived at the St Marys Inlet around 11:00 AM the next day. While entering the river I was able to watch the departure of a USN submarine from the Kings Bay sub base. 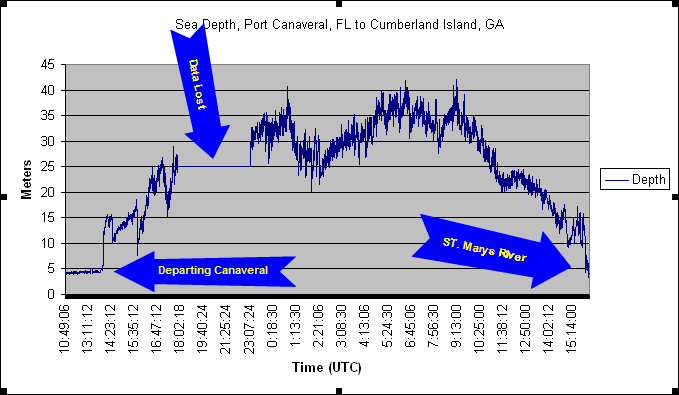 Below is a graph of the sea depths for the trip. This entire trip was on the relatively shallow shoal waters off the Florida Coast. Victor and Gigi had planned to tour the National Park on Cumberland Island the next day and invited me to join them. I also enjoyed an excellent dinner prepared by Victor on Gigi's Island. Below is a screen capture of our anchorage off Cumberland Island. dinghy and we all went ashore next to the park docks. This saved me having to launch and retrieve my dinghy that day. The park dinghy dock shown in the picture was closed for repairs that day so we just beached the dinghy and secured it with an anchor in the sand. The Cumberland Island National Park was deeded to the Park Service by the widow of Andrew Carnegie' brother, who owned nearly all of the island. The deed of the gift and her will allowed her descendants to continue to have private lots and homes on the island, but all of the land was to eventually become Park Service property. I believe that by next year (2010) over 80% of the island will be controlled by the Park Service. Today only a handful of property owners still reside on the island. The only other people living on the island are the Park Service employees. Consequently there has been no development on the island - unlike almost all of the other barrier islands from Florida to Maryland. Over-Turned Live Oak This island is also covered with Live Oaks providing plenty of shade and habitat for the horses, wild turkeys and other animal life on the island. The Live Oaks put down an extensive but very shallow root structure and are easily uprooted by a storm. Spanish Moss covers nearly all of the Live Oaks. Entrance to Dungeness At one time the Carnegies maintained a large mansion on the island, called Dungeness. The mansion was destroyed by fire (possibly arson) and abandoned by the family. The Park Service has attempted to maintain the ruins of the mansion, but there has been no attempt to restore the original building. Horse Fight With the wild horses roaming the island horse fights are also common. In the picture on the right, two stallions are disagreeing on who should be in this area. The fights are normally just a lot of snorting and bellowing with one stallion deciding to back down. We were told by one of the Park Service Rangers that the total number of horses on the island varies from year to year with the deaths of several horses each year and berths of foals. Sand Dune Leading to the Beach Besides the chance to see wild horses and the remains of the Dungeness Mansion, the other big attraction on the island is the beach. Leading to the beach are a number of large sand dunes. There are very few places on the US coast that offer such a large beach with no development next door. Fernandina Beach is supposedly a quaint and picturesque town, but the shore view provides no such indication. This is a very industrial port with several container ship terminals and two very large industrial facilities. I didn't find out what type of facilities, but they definitely put out a lot of smoke and noise. I was glad to be anchored back in the marshes, several miles from the port. I'm not sure anyone expected this storm system to be as severe or as long as it turned out. I had expected near gale force conditions for a couple of days, and then I would move on to my next port. As it turned out the storm conditions lasted for over four days, starting with numerous thunderstorms the first night as the front came through. The next day winds built out of the NE to 20-30 kts, just about as expected. Then an unexpected low pressure system formed in the vicinity of the Bahamas and slowly drifted to the west across the Florida peninsula into the Gulf of Mexico. This low caused a tightening of the pressure gradient across northern Florida and southern Georgia. The winds and rain continued to increase. I heard reports that Fernandina Beach received over 9" of rain that first day after the frontal passage. There was even more rainfall the next two days. I have no idea how much rain actually fell during the entire storm period, but it likely approached 2 feet. My concern was not the rain, but the wind and how well my anchor would hold in the Bells River bottom when the wind exceeded gale force. Above is a graph of the wind speed during most of the storm conditions. The gaps in the data are periods I had shut down the PC on which the Software-On-Board (SOB) package was recording the instrument data. 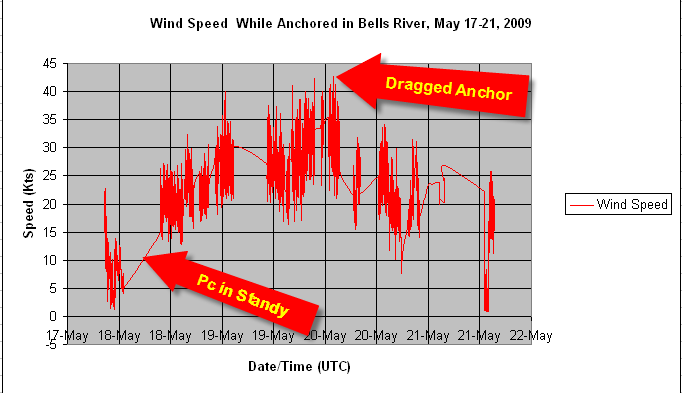 The data starts on May 18, 2009 - the day after the frontal passage. That afternoon the winds increased to 25-30 kts. The next day (May 19) the winds were 25-35 kts with gusts around 45 kts. I had reduced the sample density of the data for this graph, and most of those gusts are not shown. That evening the winds were routinely blowing over 40 kts and I was very concerned that Sarah's anchor would hold. The bottom appears to be a mixture of sand and mud. Victor had ridden out a gale several years earlier, but I don't believe that storm was as strong or long-lasting as this one. I was constantly monitoring Sarah's GPS position with SOB. 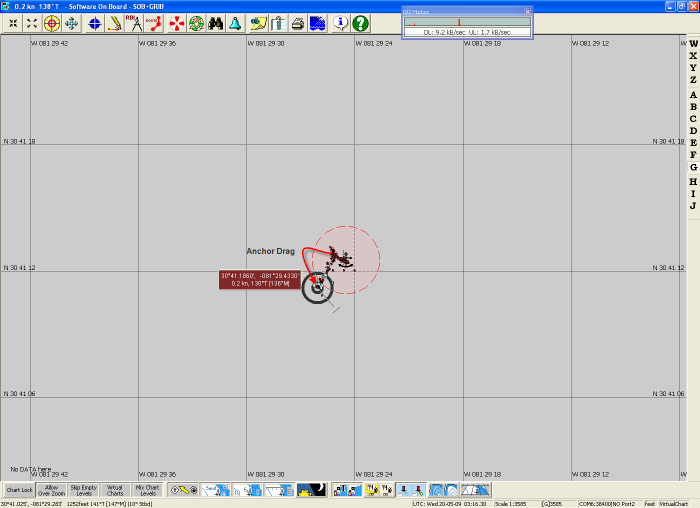 Finally around 23:00 that evening SOB started to report Sarah's position to be moving toward the SW. We were dragging anchor. I really didn't want to have to re-anchor in these conditions. It was blowing over 40 kts, pitch dark, and we were on an extreme high tide - all of the marshes that form the banks of the river were under several inches of water and invisible. If I could see in the dark and the rain, it wouldn't be of much value as it would have looked like I had anchored in a large lake. 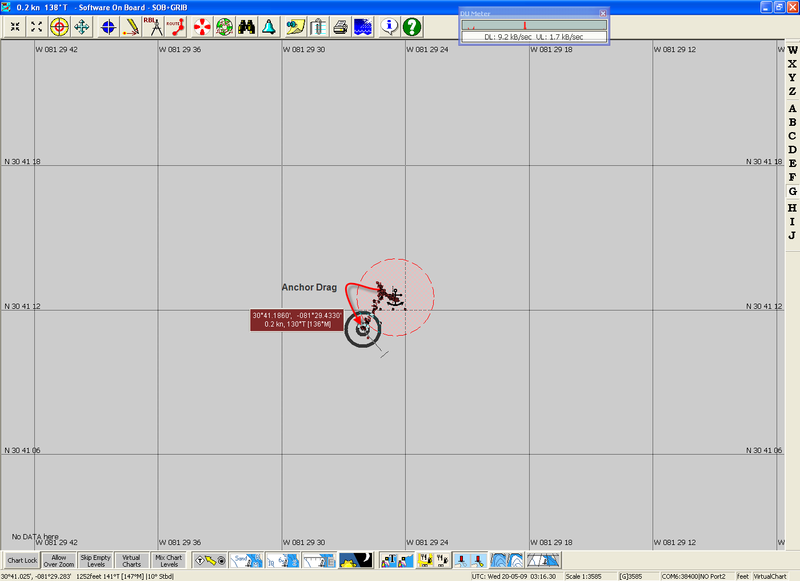 The screen capture, above, shows how much the anchor dragged. The red circle is about 50M in diameter. Just about the time I decided I could wait no longer to re-anchor Sarah's position stopped moving. I watched it for over an hour and it was clear the anchor was holding for now. Within two hours the wind was under 35 kts (seemed like a calm) and I decided to get some rest. 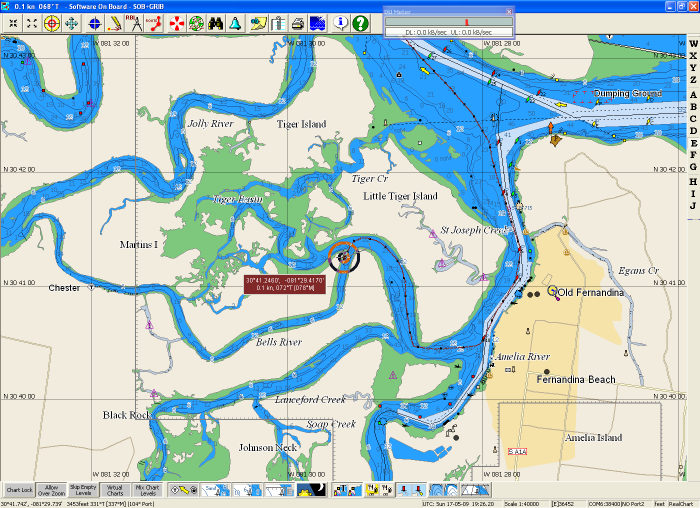 The anchor did not drag far, only about 2 boat lengths or 80', but the river is very narrow. The next morning at low tide I could see that Sarah's stern was within 2 boat lengths of the marsh shoreline. Shortly after noon the wind dropped to around 20 kts and the rain briefly stopped. I used that relative lull as an opportunity to pull up the anchor and reset it further from the western shore of the river. The anchor never budged after that. Ripped Stitches on Bimini The wind and rain did take its toll on Sarah's canvas. Several of the zippers on the Bimini tore partially loose. Also my US flag was almost completely destroyed. Flag Halyard Came Down Even the flag halyard on the main mast spreader came down. It appeared a shackle that held the halyard block to the spreader shook loose. That shackle had been there for over 6 years, including two Atlantic Ocean crossings. I did have a replacement flag on board so at least I was flying a proper ensign when I left the Bells River anchorage. By the next weekend the storm was essentially over. The winds were under 20 kts and the rain was much less frequent. It was still not pleasant weather, but I and Gigi's Island started to plan our departures. 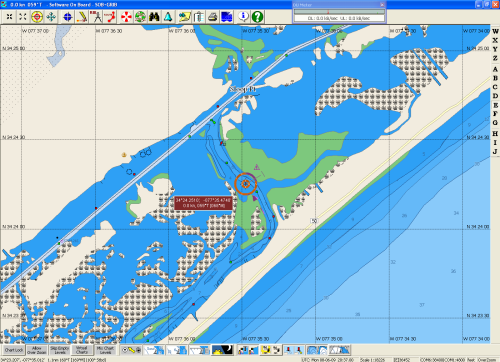 Gigi's Island planned to sail off the coast directly to Cape Fear, NC. That would be a 2-day trip, something for insurance and personal comfort I avoid. 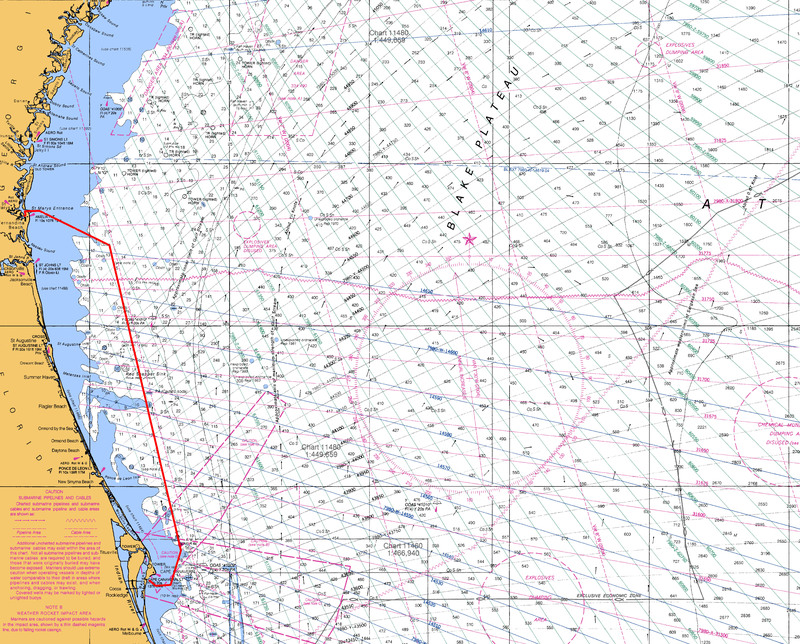 I planned to sail to Charleston, about 155 nm from Fernandina. That I could do in 24 hours. Gigi's Island decided to leave on Sunday and I bid them a pleasant and safe trip. I decided to stay one more day at anchor. 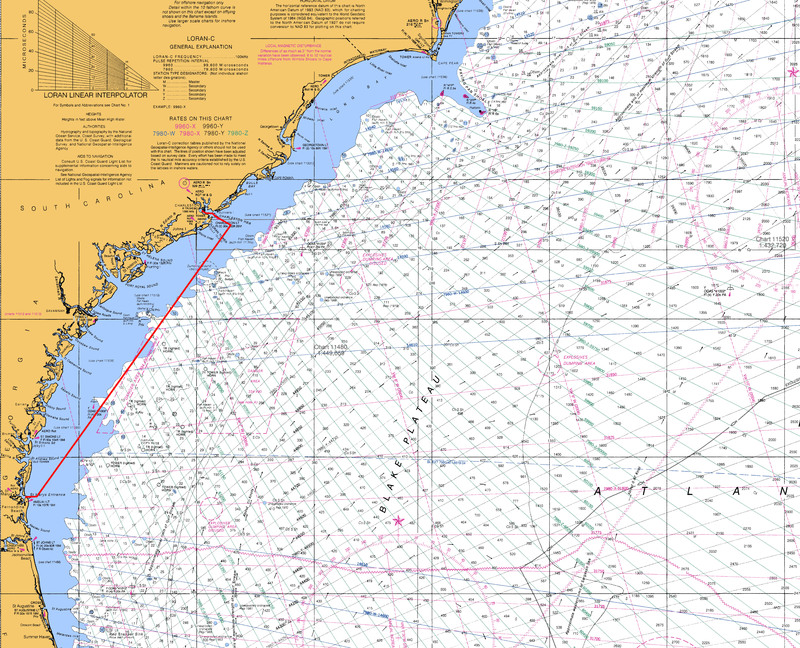 The chart above shows the route I followed from Fernandina Beach to Charleston. I left Fernandina about 10:00 in the morning and arrived in Charleston around the same time the next day. The weather for the trip was very pleasant, but there was no wind and I had to motor the entire trip. I had made a reservation at the Charleston Maritime Center for the next week. I was fortunate to arrive at slack current. Charleston has about 8' of tide and the current runs strong in both the Ashley and Cooper Rivers. I was dead tired and I know I would have had difficulty berthing Sarah in that current. As a matter of fact the dock master kept giving me instructions over the VHF on how to enter the marina. 5 seconds later I couldn't remember what he just told me. Several times I started to turn into what I thought was the marina only to have the dock master come on the radio and tell me not to go there. Fortunately this will probably be the last 24 hour passage on my way north. My next two inlets, Cape Fear and Morehead City will be much shorter runs. They will still be over-nighters, but runs of less than 20 hours. Thank goodness for small favors. Sarah in her berth at the Chaleston Maritime Center Marina. The new Arthur Ravenal Bridge over the Cooper River. USS Yorktown Directly across the Cooper River from the Maritime Center is the Patriot Point Naval Museum and marina. That is the carrier Yorktown berthed at the museum. I didn't find time to take a water taxi across the river and tour the museum. My regret. After 3 days of cleaning mildew from Sarah's cabin I finally took some time to walk around Charleston. This is East Bay Road, heading toward the battery district of Charleston. Ft. Moultrie Park Nearly all of the city waterfront that is not part of the commercial port or US Navy property is a public park. Charleston has the feel of a very livable city. Not only did I have a reasonable berth fee at the Maritime Center, but the city threw in the Spoleto Music Festival as well. The Southern Music concert was hosted at the center on my next to last night in Charleston. to Bluegrass, with a lot of other folk music forms thrown in. During my week in Charleston I had been monitoring the weather conditions just off the coast between Charleston and Cape Fear, NC - my next destination. There had been numerous lines of the thunderstorms off the coast most of the week. Fortunately toward the end of my stay the semi-stationary frontal system that was supporting these storms moved further off-shore. On June 2 I departed the Charleston Maritime Center at slack current and headed out of the harbor in near calm conditions. I motored most of that day, but a few hours before sunset a fresh breeze kicked up out of the SW and I was finally able to set sails and turn off the engine. 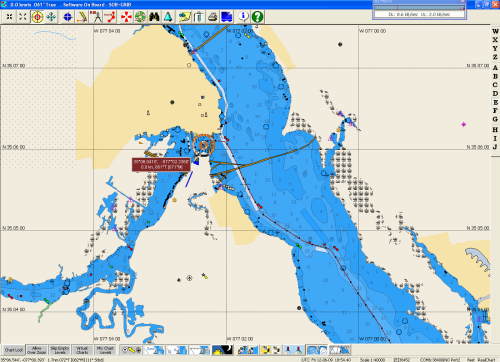 I had a very comfortable over-night sail until the wind dropped back down to a calm just as I made landfall at Cape Fear. The Cape Fear River has a strong tidal current and I was entering just after high tide. Fortunately I was able to enter the river and make it to the Southport Marina before the max ebb tide. I had planned to stay only 3 nights in Southport. I had decided to try the ICW for the remainder of the trip north. When I was ready to depart I suddenly realized I was departing on the weekend. I really didn't want to have to get through the Carolina Beach, Wrightsville Beach, Top Sail Sound area on a weekend. So I stayed two more days in Southport and left for the ICW the following Monday. I think my reasoning was sound as I encountered very little weekend boater traffic that first day on the ICW. I pushed past Wrightsville Beach and anchored just off the ICW at Sloop Pt. This is the same place Steve and I anchored on the way down the ICW from Beaufort, NC. I had hoped to avoid marina fees as much as possible while on the ICW. From Sloop Pt. I could reach Beaufort, NC in one long day, but there not many decent anchorages in the Beaufort area. The Beaufort Docks Marina is one of the most expensive on the ICW. 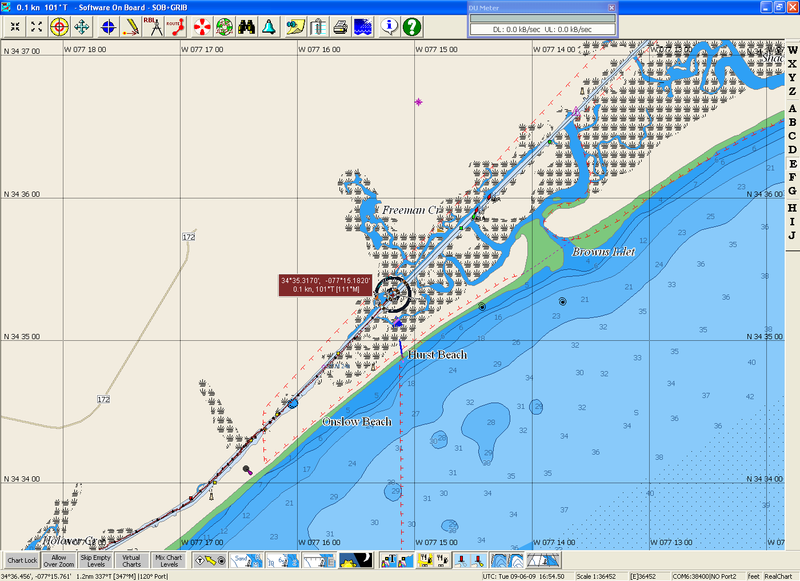 So I planned to stop early after departing Sloop Pt and anchor in the Mile Hammock Bay, which is part of the Camp Lejune Marine Corps facility. I entered Mile Hammock Bay shortly afternoon and found the anchorage empty, which is pretty unusual. The reason was immediately apparent as a gun boat sped from shore and announced that the port was in military mode and asked me to leave. So I had to keep moving on the ICW. 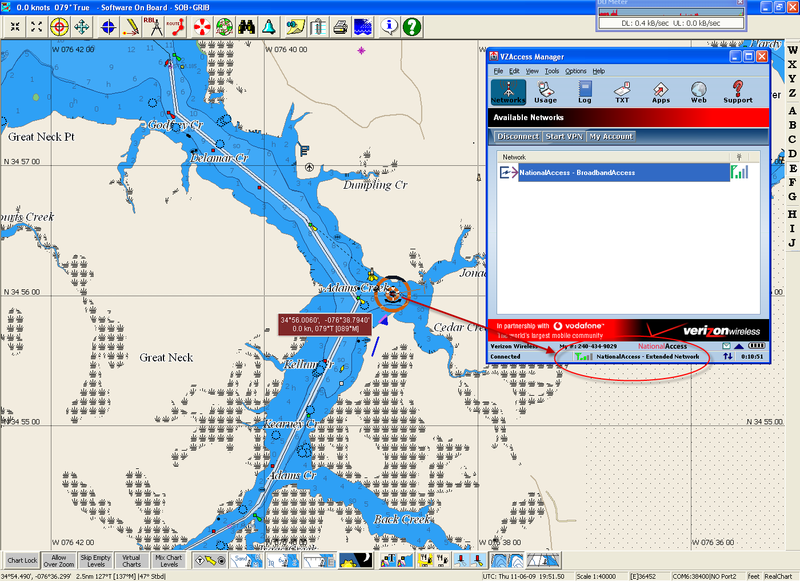 If figured if I really pushed it I might be able to get past Beaufort and drop anchor in Adams Creek. If not there are a couple of anchorages just short of Beaufort that might work. Immediately after I passed through the Onslow Beach Bridge I learned that getting past Beaufort was not in the cards. As part of the military training that closed Mile Hammock Bay, the Marine Corps has also closed the portion of the ICW in Camp Lejune for a live fire exercise. 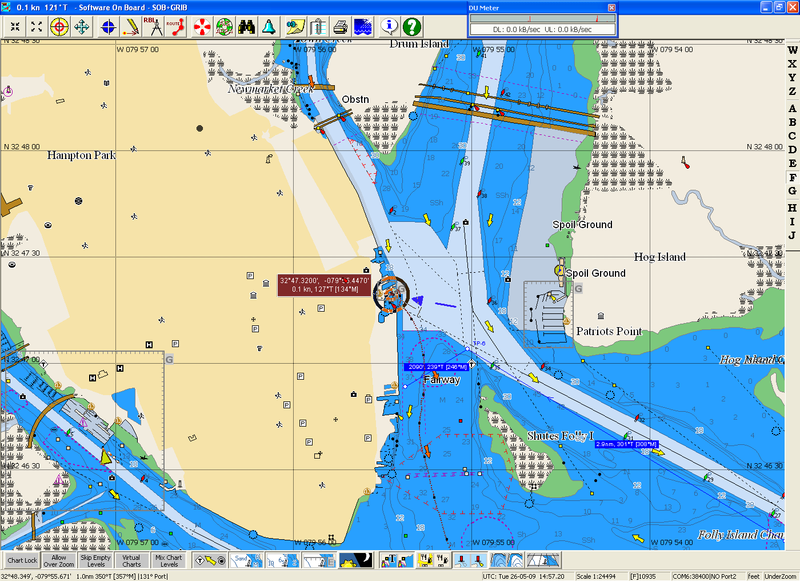 So I had to drop anchor in the ICW (as shown on the chart on the left) and wait an hour for a break in the exercise before I could continue on the ICW toward Beaufort. 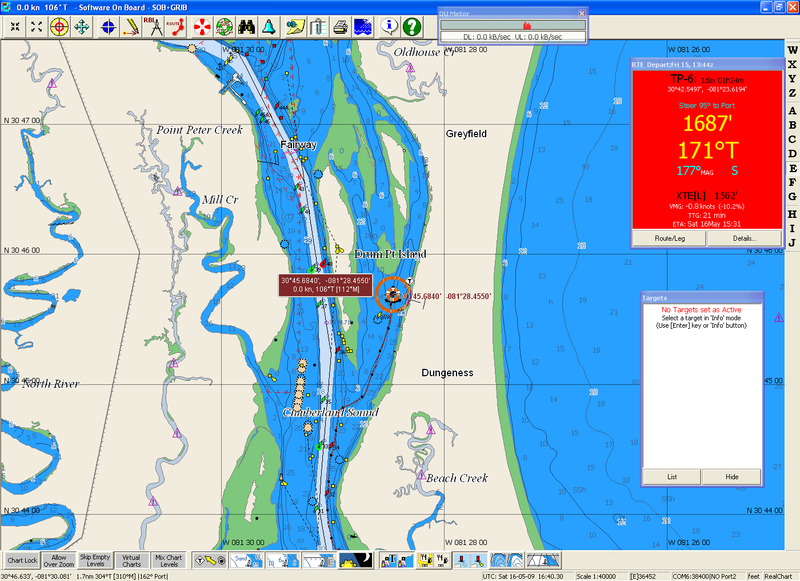 Now I was checking the anchorages just short of Beaufort. I quickly discovered that .most of these have been developed and now discourage boats from anchoring. So I called the Beaufort Docks on my cell phone and reserved a slip for that night. The Big Rock fishing tournament was taking place that week. Beaufort Docks and the other marinas in the area where full of very large sport fishing boats. I hadn't done any shopping since the day before I left Charleston so I used one of the courtesy cars provided by the marina to make a grocery run to the local Harris-Teeter. I also extended my stay in Beaufort by one more night. I used that time to try to find a marina in the Oriental area of NC. I really didn't want to keep moving north on the ICW and was looking for a place to park for the rest of the summer and probably the winter. North Carolina seemed like a good place to stop - but not at Beaufort Docks' rates. I called several marinas in and around Oriental, but none wanted full-time live-aboard slip holders. I tried to call the Mathews Pt. marina which was recommended to my by Vic and Gigi when we were together in Fernandina Beach. Unfortunately I couldn't reach anyone at the marina, everyone was apparently in Morehead City working the fishing tournament. I did reach a marina in New Bern that did have a berth and welcomed live-aboards. When I departed Beaufort the next day I was still hoping to hear from the Mathews Pt. Marina, but at least I had a potential berth in New Bern. I anchored that afternoon in Cedar Creek, just off the ICW near the Neuse River. While anchored there I found one of those cell phone Dead Zones that the Verizon advertisements say don't exist. Although the screen capture on the left shows two bars for my Verizon Broadband connection, the service came and went, mostly went. I could not get a reliable connection. Even my voice phone did not work well. After getting underway the next morning, having still not heard from the Mathews Pt. Marina, but finally getting a few more bars on my cell phone, I called the BridgePointe Marina in New Bern and confirmed that I would arrive later this afternoon and I intended to take the berth that was offered. 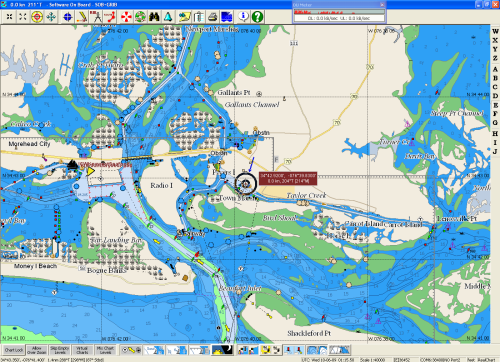 New Bern is about 24 nm further up the Neuse from where the ICW crosses. On the way up-river I passed the creek where the Mathews Pt. Marina is located. I noticed I was back in a dead zone. Later that afternoon I did get a call from the Mathews Pt. dockmaster and they had an available berth, but I told him I was going to check out the New Bern marina first and would call him back on Monday if I was still interested in his berth. Beyond the possible poor cell phone coverage at that location the dock master told me that my draught (5.5') was at the very limit of what they could accommodate and that my keel would normally be in the mud at low tide. When I arrived at the BridgePointe Marina later that afternoon (screen capture on the right) I found over 10' of water at low tide and 4 solid bars on my cell phone. Looks like I'll be staying in New Bern for at least the next 6 months.